The One Fly Fly was designed for the American One Fly competition, ideal for trimming off what you don't need on the day. Hook : Scorpion all purpose med #10. Thread : Strong fine thread. 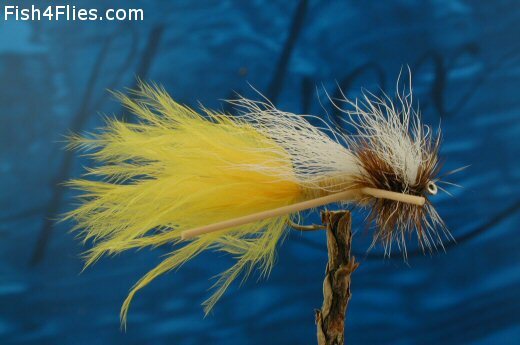 Tail : Hackle fibres with marabou over. Hackle : Red game and grizzle mixed. Wing : Calf tail, tied in both Trude and Lee Wulff styles. Legs : Round rubber legs, tied Madam X style. Once on the water trim off the bits you don't need. Currently there are no comments about the One Fly Fly fly pattern from other fly fishermen yet.